A nutritious blend of golden milled flaxseed with dried cranberry, banana, blueberry & wild arctic lingonberry. Sprinkle over your daily porridge for added fibre and to aid energy release. 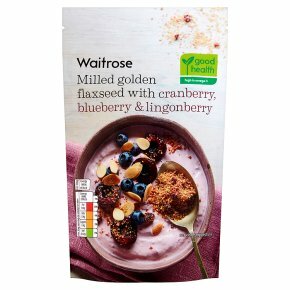 INGREDIENTS: Milled golden flax seed (85%), dried cranberry (5%), banana flakes, dried blueberry (3%), dried lingonberries (2%) (lingonberries, grape juice, sunflower oil).